Our services are available for any day of the week, including on bank holidays. How can I benefit from a professional shed assembly session? First things first – you need proper equipment and a mere hammer won’t cut it. The experienced handyman, on the other hand, will carry ladders, sawhorses, circular saws, nail guns, drills… In other words, the pro will arrive more than prepared to get your metal shed assembly project up and running in no time. 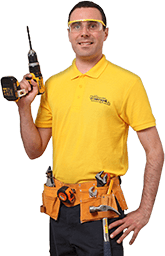 A trained specialist will also know how to safely handle all power tools involved, as well as take care of the wiring if you decide to outfit your man cave with a large LCD TV or a fancy lighting system. Lastly, all pros are also covered by a £5 million insurance. The area where I want to place my shed isn’t levelled. What now? The knowledgeable team can lend you a hand with that as well! Let us know the type of shed you’ve chosen – plastic, wooden, or metal – so that the experts can suggest the optimal shed floor construction for your needs. For example, a wooden shed is usually set on treated lumber skids, while metal ones are reinforced with concrete blocks. If the area you’ve chosen is solid, but uneven, we can place a levelled subframe and build the shed on top. Note: Cement, sand, flagstones, and other building materials will be included in your final price. How long will my wooden/plastic/metal shed installation session last? The length of your session will mainly depend on the type of shed you’ve chosen to place in your yard. For instance, if your wooden shed construction also comes with an extra storage room, then this will require significantly more planning and nail gun work than a regular shed. Material and size aside, another important factor is the shed’s purpose – will it be used for storing tools or for relaxing after a hard day at work? Knowing what your ideas are will help us send the right pros and give you an accurate time estimate for your project. My old wooden shed construction needs to go. How can I make that happen? Just give us a call and the professionals will help you dismantle your shed part by part. Sometimes, this process may take up to an hour or two, based on such things as how light the materials are, the complexity of the shed roof construction, and whether the shed has a storage compartment. However, the dexterous pros will always be armed with the right tools and lots of patience to safely disassemble and remove even rusty or rotted sheds. Now, with the old shed removed, the only thing standing between you and your new one is your imagination!